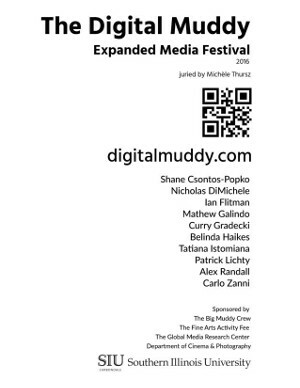 Digital Muddy Expanded Media Festival is designed to be an online platform that promotes interaction and cultural discussion with a focus on the terms related to expanded cinema; social media, and net based contemporary art practice. Digital Muddy’s selected works represent a survey of various styles and practices that engage the expanding use of image and in specific screen based digital narrative. This year we are focusing on net-specific published works and browser-based works that are defined in the categories of new media, net art, interactive, digital and electronic imaging, user generated imagery, participatory, experimental, social engagement, sound, 3d and digital animation. production and brought to you with the help of the College of Mass Communication and Media Arts at Southern Illinois University. Funding and support brought to you by the Department of Cinema and Photography and also by the Fine Arts Activity Fund.